Indications of laparoscopic ureterolithotomy include large, impacted, upper/mid/lower ureteric stones leading to obstruction, where other minimally invasive treatments have failed. Laparoscopic ureterolithotomy is indicated for large impacted ureteric stones preferably in the upper- and mid-ureter, as the results of extracorporeal shock wave lithotripsy and ureteroscopy are poor and require multiple sittings and auxiliary procedures. By contrast, laparoscopic ureterolithotomy achieves complete stone clearance in a single operative session in a minimally invasive manner. is reflected medially and the ureter is identified by visualizing the ureteric peristalsis and the stone bulge. Avertical incision is made over the stone bulge to remove the stone. The ureterotomy is then closed with interrupted, intracorporeal free hand suturing using 4/0 Vicryl suture. Typically, a double J ureteric stent or open ended ureteric catheter is placed cystoscop-ically, then the patient position is changed for the laparoscopic ureterolithotomy. The preplaced stent also helps in identification of the ureter. Alternatively, the stent can also be placed intraoperatively under laparoscopic vision antegradely through one of the ports as described for pyelolithotomy. Sometimes the stone is impacted and it is impossible to preplace a stent. In this circumstance, the J stent with a guide wire or open-ended ureteric catheter is retrogradely advanced up to and underneath the stone in the ureter. After stone retrieval, the ureteric stent is advanced into the renal pelvis under laparoscopic guidance. In some of these patients, we experienced difficult negotiation of the stent due to down slipping of the stent during position changing of the patient. Therefore, at the end of the procedure these patients were repositioned in lithotomy and the stent was inserted under fluoroscopic guidance. Because of this problem, in several subsequent cases we placed an end-hole ureteric catheter through which a guide wire was inserted up to the stone. 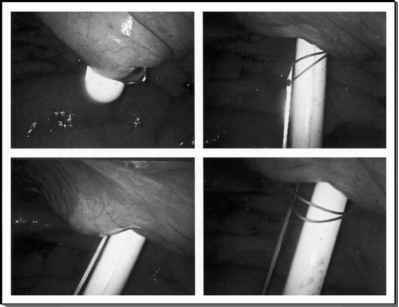 After retrieval of the stone, the guide wire was advanced into the renal pelvis under laparoscopic vision, and a stent was advanced over the guide wire. The guide wire was introduced into the ureter through the ureteric catheter, even though it had slipped down a little during the change of patient position. With increasing experience, we modified our technique again to make the procedure minimally invasive and cost effective. In patients where there is no history of stone impaction or any other absolute indication such as infected hydronephrosis, we do not place a J stent into the ureter at all. The ureterotomy is closed with 4/0-Vicryl by interrupted, intracorporeal suturing. The advantages are shorter operating time, avoidance of fluoroscopy, cost reduction, and reduced invasiveness since an additional procedure, e.g., initial cystoscopy for J stent placement and, later, for its removal is avoided. No increase in the duration of drainage or complication rate was noticed after this technical modification.